China Children and Teenagers' Fund and Beijing Daily are sponsoring three goodwill performances of the full-length ballet "Legend of the Great Archer" by the Hong Kong Ballet at Beijing's Poly Theatre on January 3 to 5. Premiering in May 2004, the ballet was created by Stephen Jefferies, the former Royal Ballet's principal dancer and currently artistic director of Hong Kong Ballet, to celebrate the company's 25th anniversary. Jefferies was inspired by the old Chinese folk tale about the Archer God Yi, who is sent to Earth to help the Emperor extinguish the many suns scorching his land. Jefferies created the ballet with an underlying tangle of emotions. And the heat on the stage is not just from the 10 suns hovering in the sky. The performance sizzles with passion, jealousy, intrigue and murder in a tragic tale of love and betrayal. In the ballet, the Archer God Yi (Liang Jing) is sent to Earth to bring the rebel suns under control. The Emperor (Wang Jia-hong) has promised his daughter, Princess Jade (Faye Leung), to the conqueror of these suns. Jade, however, has a secret lover in Chief Bodyguard Feng (Nobuo Fujino), who is, in turn, loved by the Princess' Maid (Ayako Fujioka). By the end, Yi returns from fighting monsters, bearing the elixir of life. The wily princess drinks it all and becomes the immortal Lady of the Moon Chang'e. Jefferies' handling of the large corps keeps the stage alive. As an acclaimed principal dancer with England's Royal Ballet, he has performed classical, neo-classical and contemporary works by the greatest choreographers. He has been artistic director of Hong Kong Ballet since 1996, and a choreographer in his own right. In fact, references to his former mentors abound in his "Legend of the Great Archer." His choreography blends ballet with the Chinese long-sleeve folk dance. "The dance is very lively and enriched with innovative expressions," Jefferies said. "The ballet is a powerful interpretation reflecting Hong Kong's distinctive international identity," says Zhao Ruheng, president of the National Ballet of China. 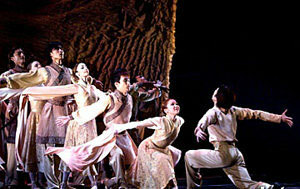 It is a combination of Western performing art and Chinese music under the framework of ancient Chinese mythology. It represents the uniqueness of Hong Kong's culture, a fusion of East and West, modernity and tradition," she says. Established Hong Kong composer Kuan Nai-Chun wrote the original score for the full-length ballet by turns jazzy, grand, dissonant and bombastic. Sam Leung's stage setting features the ceremonial tents and intimate boudoirs made of yards of gorgeously textured fabric, while intricate, light designs swirl on the back wall and the floor. Leo Cheung's beautiful lighting is as tonally rich as the music. And Virginia Chu's faux dynasty costumes include those of the soldiers, which conjure up the terracotta warriors discovered in Xi'an. By introducing multi-media visual effects including a two-minute film and laser presentation, the production brings a new language to the ballet culture. Founded in 1979, Hong Kong Ballet now has 38 dancers from Asia and Europe. "Its male dancers can spin like tops and execute all the tricks, while the women are lyrical and graceful, displaying lovely lines and port de bras," says critic Lun Bing.